^ There were about 1,000 graphemes in the Old Kingdom period, reduced to around 750 to 850 in the classical language of the Middle Kingdom, but inflated to the order of some 5,000 signs in the Ptolemaic period. Antonio Loprieno, Ancient Egyptian: A Linguistic Introduction (Cambridge: Cambridge UP, 1995), p. 12. Allen, James P. Middle Egyptian: An Introduction to the Language and Culture of Hieroglyphs. Cambridge University Press. 1999. ISBN 0521774837. Collier, Mark & Bill Manley. How to Read Egyptian Hieroglyphs: a step-by-step guide to teach yourself. British Museum Press. 1998. ISBN 0-7141-1910-5. 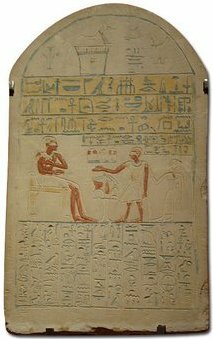 Selden, Daniel L. Hieroglyphic Egyptian: An Introduction to the Language and Literature of the Middle Kingdom. University of California Press. 2013. ISBN 0-520-27546-2. Faulkner, Raymond O. Concise Dictionary of Middle Egyptian. Griffith Institute. 1962. ISBN 0-900416-32-7. Gardiner, Sir Alan H. Egyptian Grammar: Being an Introduction to the Study of Hieroglyphs. The Griffith Institute. 1973. ISBN 0-900416-35-1. Hill, Marsha. Gifts for the gods: images from Egyptian temples. New York: The Metropolitan Museum of Art. 2007. ISBN 9781588392312. Kamrin, Janice. Ancient Egyptian Hieroglyphs: A Practical Guide. Harry N. Abrams, Inc. 2004. ISBN 0-8109-4961-X. McDonald, Angela. Write Your Own Egyptian Hieroglyphs. Berkeley: University of California Press, 2007 (paperback, ISBN 978-0-520-25235-6).